This is the perfect time to say goodbye to the year 2018 and the assignment writing woes as well. NeedAssignmentHelp is offering you great discount and offers on all assignment bookings. New Year vacations are going on and students are assigned to complete lengthy projects and assignments during these vacations. It makes them a little upset as they have to maintain a distance from all the New Year preparations and gatherings as they are required to focus on their academic assignments. There is no need to spoil your New Year vibes just because of the complex and lengthy assignments assigned to you by your professors. Leave that stress and responsibility on us and we promise to yield you the satisfactory results. We are here to add some bliss and happiness to your New Year celebration. Now you can save greatly on any of your academic assignment. The countdown begins. NeedAssignmentHelp is gifting you exciting New Year and Christmas offers. Save greatly! Students can grab exciting 15% off on assignment booking on the occasion of New Year. Another steal of a deal offer is giving you amazing benefits. Order 5 assignments of similar subjects of minimum 1500 words each and pay only for the 4 assignments. It means you can get 1 assignment for free. New Year is the time to relax and get together with family and friends so why waste it on preparing the boring assignments. Break the shell and get amazing discount that will make your pocket happy. Students are not required to compromise their festive time in crafting the plethora of assignments. Many students try to finish off the assignments quickly and in that case they miss out meeting the quality of assignment. We never compromise with quality of our content. Our subject matter experts are highly qualified degree holders. They hold years of experience in assignment writing and that is why they are aware of all the university guidelines. This New Year we will be gifting you impeccable quality of assignments at an affordable price range that no one can compete with. There is more in store that will surely add glitter and fun to your New Year celebration. 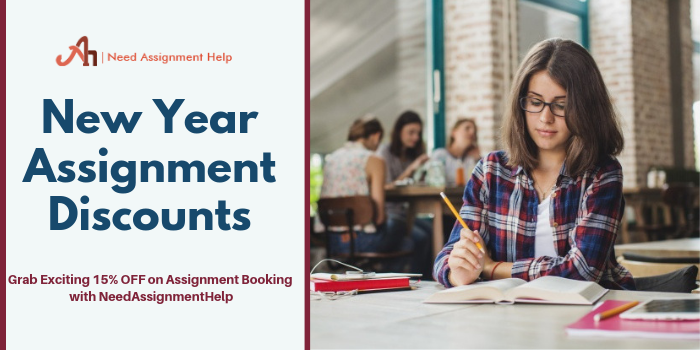 As we all know that New Year is about getting a fresh vision and good habits that can shape up our future in most positive aspects then why not choose a reliable assignment help. Picking up a good assignment and homework help for yourself will surely ease your burden and help you focus on other academic tasks. We are here to solve all your academic dilemmas by our expert assistance. Just drop in your assignment requirements to us and be stress-free. Our experts will take care of the rest of the work. Enjoy the vacations with your near and dear ones without worrying about your pending assignments. We will provide you the exact assignment help that you are longing for. You just focus on welcoming the New Year with great enthusiasm. We wish you all the happiness in coming year.